women's rights movement with Susan B. Anthony for over fifty years. Help bring this film to the screen in 2020. 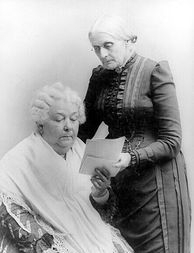 Screenwriter Arlaine Rockey, as an Executive Producer, is seeking funding, producers, a female director, and actors to bring Elizabeth Cady Stanton - The First Suffragist to the screen in 2020, the 100th anniversary of the 19th Amendment, which gave women the right to vote in the United States. Arlaine Rockey is accepting and appreciates all crowdfunding donations to assist in this endeavor via GoFundMe as well as your sharing this page with anyone you think might be interested in participating in this endeavor. This will be the first biopic of Elizabeth Cady Stanton, the pioneer feminist who improved the lives of millions of women. 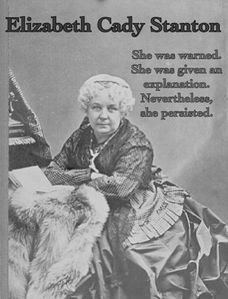 Elizabeth Cady Stanton was the intellectual and radical force behind the original women's rights movement for over fifty years, but when she published a feminist critique of the Bible in 1895, she was publicly censured for allegedly damaging the cause of suffrage. Based on true events and research drawn from multiple sources, all in the public domain, Elizabeth Cady Stanton - The First Suffragist is a moving, sometimes humorous, and inspirational biopic about an American hero. Arlaine Rockey's screenplay, Elizabeth Cady Stanton - The First Suffragist, placed in the top 20% in the 2018 Nicholl Fellowship Screenplay Competition and the second round (top 15%) in the drama genre in the 2018 and 2016 Austin Film Festival Screenwriting Competitions. The Woman's Bible (ECS' radical feminist critique of the Bible, published in 1895). Thank you for your help in this monumental effort!